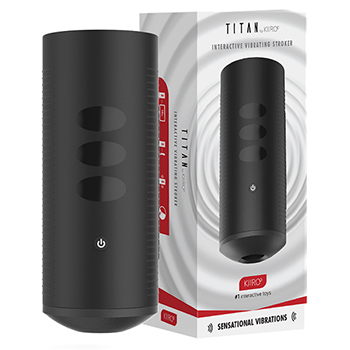 TITAN by KIIROO is a handheld stroker with touch-sensitive vibration technology. As the first solo branded product by KIIROO, TITAN sports a real-feel sleeve and 9 vibrating bullets that intensify your masturbatory experience. Play alone and enjoy the many different modes and speeds that TITAN has to offer. Connect TITAN to one of over 4,000 interactive videos on a range of different content platforms. Feel every movement made by your favorite stars, whether it is in 2D or VR, we have you covered. Connect to your partner(s) devices from anywhere in the world and Feel every movement they make through the vibrations on your device. Share your pleasure with them using the touch-sensitive pads and control the speed and intensity of the vibrations or stokes on your partner's device.